I swam competitively and was a gym rat for a number of years. But chasing wins, fitness, muscle just seemed pointless and self-absorbed after a while. 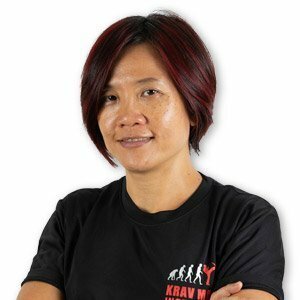 Around 2008 I attended my first trial Krav Maga class, and was intrigued by the no-nonsense, practical approach to what I could see being an actually useful life skill. It wasn’t until about 2013 that I began learning Krav Maga in earnest. Five years on, I am even more fired up and hungry. To keep learning, but also with a passion to help others discover this no-BS training ground for life – body, mind, resilience; channeling aggression, fear, stress; awareness of environment, people, self. So that one may walk in peace. Sadly over the years, some schools of KM that have gone off track, in my view. So joining the Kravolution family has been like a sweet homecoming: A return to the reasons I fell in love with KM in the first place. Not about chasing grades or patches, but about the real world. Not about egos, katas and whose way is better; but about constant questioning, humility and the openness to learn from any discipline/source that can make you a better warrior.